The open day in the UK featured several Terex Finlay models. The Terex Finlay open day in South Yorkshire, England, saw more than a dozen crushing and screening models showcased to clients in addition to prototypes of machines to be released shortly. A fleet of 13 new Terex Finlay crushing and screening models showcased their prowess at a recent open day held recently in the UK that attracted more than 200 local and international end-user customers. The onsite demonstrations featured five machines that have been introduced to the market this year. In addition, on display were two crusher prototypes that will be released by the end of this year. 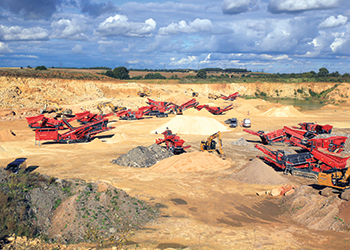 The event and product demonstration were hosted just outside Doncaster by Catplant, a leader provider of quality aggregates and recycling solutions in South Yorkshire, England. He says Terex Finlay’s new product developments this calendar year have been unprecedented. Prototype of the I-140 impact crusher ... set for launch by year-end. • Terex Finlay J-960: Launched in Q1 2015, this is a compact and aggressive mobile jaw crusher incorporating a proven Terex direct drive single-toggle jaw crusher which gives high capacity with large reduction capacities. The plant features a heavy-duty hopper with integrated vibrating grizzly and pan feeder as standard. Its compact size, excellent mobility and high crushing capacity even at tight settings in recycling and hard rock operations make the J-960 ideal for small- to medium-sized operators, says a spokesman for Terex Finlay. • Terex Finlay J-1170AS: This jaw crusher provides the flexibility of a crushing and screening plant on one machine. Launched in Q2 2015, it features a detachable on-board after screen that delivers a single-sized spec’d product, removing the need to a second machine. Its robust hydrostatically driven Terex jaw chamber provides high capacity with large reduction ratios. The jaw chamber configuration can be set up specifically for quarrying applications or processing construction demolition debris using the hydraulic release chamber option. According to the spokesman, the J-1170AS features a heavy-duty variable speed vibrating grizzly feeder (VGF) and integrated prescreen giving excellent production throughput in quarrying, mining, demolition and recycling applications. • Terex Finlay C-1545: This high-capacity and aggressive cone crusher consistently provides high output capacity and a product with excellent cubicity. This efficient and productive machine incorporates the new Terex 1150 cone crusher driven by direct clutch drive with variable speed, automatic tramp relief and hydraulic closed side setting (CSS) adjustment with electronic monitoring system that ensures ease of operation. The large hopper/feeder has a metal detection and a purge system to protect the cone and reduce downtime by removing metal contaminants via the purge chute. • Terex Finlay 873: This heavy-duty screen has been engineered to work as a primary screen in quarry, demolition, C&D (construction and demolition) recycling, landfill material, topsoil, sand and gravel, coal, slag, ore processing and aggregates. This new model offers small- and medium-sized operators an aggressive, flexible and class-leading machine with a wide range of available screening media configurations. Launched in the second quarter of this year, the machine has the capability of processing material up to a rate of 450 tonnes per hour. Terex Finlay 873 ... engineered to work as a primary screen. • Terex Finlay 693+ Spaleck: This inclined screener, which was also launched in the second quarter, is the ultimate in mobile fine screening and separation technology. At the heart of the plant is an innovative two-deck German designed and constructed high-performance screenbox with flip flow technology on both the top and bottom decks guaranteeing first-class screening of difficult materials. 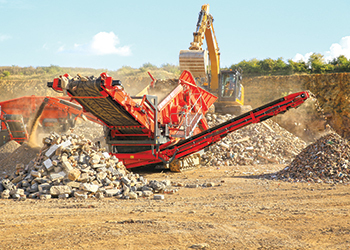 “Its processing capabilities and application flexibility make the machine the ultimate tracked mobile solution for the processing and separation of recycling materials such as incineration slag, shredder light and heavy fraction, scrap metal, electronic scrap, compost, clay, quarry dust, agg-lime, plastic fractions, biomass, topsoil, ore and aggregates,” he says. 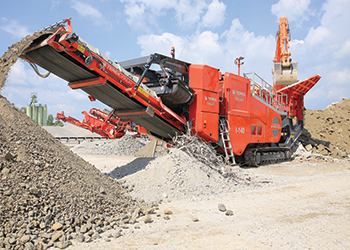 In addition to these machines, two new two crushers prototypes – the I-140 impact crusher and C-1540S cone crusher – were also previewed. These are set for launch in Q4 2015. The C-1540S cone crusher offers direct drive transmission via clutch making it fuel efficient. A hydraulic tramp relief with automatic reset protects the chamber and minimises downtime. It also has a metal detection system on the feed belt with ‘auto-stop’ to protect the cone from tramp metal, while the purge system removes contaminants from the machine. The key features of the I-140 include a great improvement in the ease of material flow through the machine, with each component increasing in width as the material moves through the machine. The fully hydraulic assisted apron setting features makes adjustment of the aprons convenient and efficient. And a heavy-duty VGF with integral pre-screen removes dirt fines.